Can the Stocks Bull Market Continue as Uncertainty Recedes? Jon D. Markman writes: Stocks rose briskly in the second half of last week as investors cheered the return of General Motors Co. (NYSE: GM) shares to the Street and the return of Irish budget officials to the debt negotiating table. It's amazing how quickly people forget what a horrible company GM was and what a mess Dublin has made of governance. In a twinkling of an eye, all was forgiven. Must be a bull market. All the major U.S. indexes ended the week around where they started, though there was a big dip in the middle as prices went way down and then recovered. Looking back to the Wednesday low we can see that there was a 3.8% correction from the prior high, right in the middle of the 3% to 5% correction we expected. Was that really enough of a dip to allow stocks to motor higher into the rest of the month? There's room for skepticism. It's more common for the correction of a steep, two-month up-trend to persist until conditions become fully oversold. That's how the kinetic energy for the next move higher is restored. The benchmark index ended on Friday a touch shy of the critical 1,200 level. And four attempts to bust through that level were repelled by bears. So on the one hand the two-week downtrend from the early November highs was broken, which was awesome, but on the other hand the bears have now managed to keep the benchmark index under 1,200 for five days, which is worrisome. That makes the Monday sessions very important. Bulls need to build on their Thursday success and retake the 1,200 level. Bears will try hard not to let that happen. A great battle looms, and whichever side wins this one will retain the upper hand for the next few weeks. Hang on tight. Looking at sectors, we see that basic materials, industrial manufacturers, techs and financials led on the rally, while utilities and retailers lagged. It was a great session for oil and gas funs like SPDR S&P Energy Services (NYSE: XES) up 2.5%, as well as for three our old favorites, iShares MSCI Thailand Fund (NYSE: THD), up 3%, Market Vectors Junior Gold Miners ETF (NYSE: GDXJ), up 2.6%, and iShares MSCI Chile Market Index (NYSE: ECH), up 2%. When you can lock into a great trend like materials, you can really make great gains. Still, I was impressed by the extent to which all assets in the world locked arms. This is very unusual from a historical perspective. We appear to have entered another period in which all correlations are going to 1.0, as most asset classes, commodities and regions are rising and falling together. The whole concept of diversification is on the verge of going out the window. A South African gold mining stock, a Canadian oil driller, a California retailer, a Chinese media producer and an Illinois machine parts maker all are finding their fates linked together as if there was a single string that pulls them all along. This is great when it works on the upside and you are long, but we have also seen the dark side of this behavior when the chain is yanked lower, as in the second half of 2008. At this point it's valuable to point out that much of this back and forth between bulls and bears is like a conversation between money managers. It's about which of two narratives has more force: The one that says the U.S. economy is improving, and the U.S. Federal Reserve is right to give it a new nudge in the right direction to make sure it does not backslide, or the one that says the U.S. economy is held together with bubble gum and twine, and the Fed's action is a desperate ploy by a morally bankrupt regime to retain its slipping grasp on power. Cynics will pick the latter but my guess is that in the fullness of time we will see that the former is the correct answer. As a result my expectation is that before too long, and possibly as soon as Wednesday, the market will soften its glide path, stabilize, start to creep higher, slip one more time, and then head higher for good. One big factor that I haven't mentioned is the dollar. Remember I've pointed out for months that the dollar is leading U.S. equities around on a leash. When the dollar rises, stocks fall, and vice versa. Well it turns out that the second round of quantitative easing announced by the Fed is giving the dollar a big boost at a time when it was widely expected to do the opposite. The reason is that the Fed is trying to lift inflation expectations. Since bonds hate inflation, QE has been death on bonds. And what happens when bonds go down? Their yields go up. And the dollar is highly sensitive to yields, as currency flows are the most attracted to countries with higher relative interest rates. So we're in a Catch 22, which is appropriate I suppose. The Fed wants U.S. investment confidence and equities to go up. But its action are perversely pushing up the value of the dollar, which has a repellent effect on stocks! I know, I know. This makes my head hurt too. If I had to guess, the cycle will break when anger over QE2 is so intense that Fed governors start to make comments that lead market participants to believe that it might amount to less than $600 billion -- a huge contrast to current expectations that it could exceed $2 trillion. If investors come to think QE2 will be constrained, they will stop selling bonds, which will let rates ratchet down, and stocks can go up. In more Federal Reserve news, you will be happy to learn that San Francisco Fed exec vice president John William says quantitative easing is working great. He added: ''I see the risk of high inflation as remote,'' because ''there are no signs of the kind of overheated economic activity that triggers inflation.'' A Wall Street Journal account of the talk reported that he expects U.S. gross domestic product (GDP) to clock in at 2.5% this year, 3.5% next year and 4.5% the year after that -- a view that is well above that of independent forecasters. However, he was quick to add that he expects unemployment to remain around 9% through the end of 2011, fall to 8% in 2012 and not get back to 6% until mid-decade. If that's optimism, I'd hate to see what the pessimists say. One major economic release of the week came from a report on October's retail sales in the United States. It was encouraging to see that consumption is improving, with a 1.2% month-over-month increase reported at stores. About two thirds of that increase was due to a whopping 5% month-over-month increase in auto-related sales. If that ends up giving us insight on the future, we can call it "vroom with a view." The car sales advance was so much larger than the numbers shown by auto manufacturers that it looked like a glitch in the data, possibly owing to how the seasonal adjustment process might have been messed up by the Cash for Clunkers program last year. But even the 0.4% increase in non-auto sales was enough to be happy about. Some of the best gains across the market came from high-end retailers such as Coach Inc. (NYSE: COH) and Nordstrom Inc. (NYSE: JWN). Not a lot of the gains were due to inflation, either. Gasoline station sales were only up 0.8% and food was up just 0.3%. Some of the bigger gains were just in down-and-dirty retail, such as clothing sales, +0.7%, sporting goods, +1% and building materials, +1.9%. This is also good to see since a big-picture recovery in U.S. GDP will be built purchase by purchase at the retail level like this. On a year-over-year basis, retail sales are now up 6.3%. Much of the upside has come from vehicles, which are up 10.3%. Outside of vehicles, sales are up 5.8%, the fastest pace since June 2006, says Ned Davis Research. Peering a little closer, we see building materials & garden equipment & supplies store sales have risen 9.0%, the most since April 2006. Meanwhile, non-store retail sales have grown 14.0%, the most since May 2006, and restaurant sales are up a ton. The only real laggard is apparel sales, which are only up 3%. On the downside of the data in the past week was word out of the Empire State manufacturing index -- not sure why they don't just call it New York -- fell by 11.1 in the latest sounding, vs. the +15.7 increase in October. That suggests that stronger demand seen from overseas over the summer and early autumn may be weakening. When the economists put the data in their data regression machine they are likely to see fourth-quarter GDP only a fraction better than the +2% seen in the third quarter. Big news on the merger front came from Caterpillar Inc.'s (NYSE: CAT) purchase of Bucyrus International Inc. (Nasdaq: BUCY), a maker of the gigantic tractors and shovels used for super-sized operations like oil sands and copper mines. This shows that Caterpillar thinks the mining cycle will continue and accelerate. And on the tech front, EMC Corp. (Nasdaq: EMC) finally announced the purchase of Isilon Systems Inc. (Nasdaq: ISLN) for a 28% premium over Friday's price. Isilon is one of the great new high-end digital storage companies that was in my slide deck at Money Shows over the past year as an up-and-comer. If you missed it, hey, no biggie, ISLN was only up 392% this year. And a little more than that since 2009, as shown above. I'm happy for them but it's a bittersweet moment because every time one of these great little companies gets sucked up in to a borg like EMC it's another one that will never be up 10,000%. That's why I hope our F5 Networks Inc. (Nasdaq: FFIV) stays single until it's an old maid. Storage continues to be one most important demands in technology as we can see just today when Facebook announced it would create a new email system for its 500 million customers. Imagine how much storage will be required for people who expect their emails will be preserved for posterity somewhere in the cloud. To give you an idea of the magnitude: MSN Hotmail is the largest email provider at present with 361 million global users, followed by Yahoo! Mail at 273 million and Gmail at 193 million users, according to comScore. So now add another email system on that, which would admittedly take away users from those other services, and you can see the magnitude of storage providers' challenge. One big plus for the week, besides the successful launching of the GM initial public offering, was a much larger than expected rise of the Philly Fed Manufacturing Index and a slightly lower number of initial jobless claims than expected. Also helping was news out of Europe that Ireland said it was likely to ask for aid from the $1 trillion Eurozone bailout fund. When that news hit, the euro rose and the dollar fell -- igniting the "carry trade" that boosted emerging market and commodity stocks as well. Once again, it's all correlated. On the U.S. equity front, several retailers and techs reported positive earning, headlined by Victoria's Secret owner Limited Brands Inc. (NYSE: LTD) and wireless equipment maker Aruba Networks Inc. (Nasdaq: ARUN). LTD also announced another big special dividend and a stock buyback, showing that companies will boost their own stocks even if investors are still gun-shy. The Irish stock market closed 2.5% higher in the week a rare respite after officials of the European Union (EU) and International Monetary Fund (IMF) landed and surveyed the ground in Dublin. The problem over there, in case you have tuned out, is that the Irish banks are sitting on huge losses and cannot roll over their debt. This has escalated into becoming a systemic issue because the Irish government guaranteed all the Irish private-sector bank debts at the peak of the financial crisis in 2008. It gets worse. The main concern of the EU and IMF is that the Irish banks owe a lot of money to other European banks and other European banks also own shares of the Irish banks. It all got very cozy when Ireland was being celebrated as the "Celtic Tiger" after it slashed corporate tax rates in the late 1990s and attracted a lot of major tech companies like Microsoft and later Google. But the government essentially squandered the benefits it won from those companies and lavished services on its citizens, and now that there is a lot less tax revenue there are massive holes in the Irish budget. The Irish have been reluctant to accept EU and IMF help because it is both embarrassing and they know the new overlords will require stiff austerity measures that citizens will rebel against. It's a big mess and simply tapping the EU fund is not going to make it go away. Countries like Argentina and Russia took years to dig out of similar troubles in the 1990s. Don't cry for me, County Kerry. All told global markets are still in a primary uptrend, but they go through these periodic spasms of discontent. They are good for blowing off the froth. But I do not want you to get too downcast. There is always a tricky transition period after major economic and political events, and I think that's what we are enduring now. I ran this chart on Monday night, but I liked it so much I am running it again for those who might have missed it. 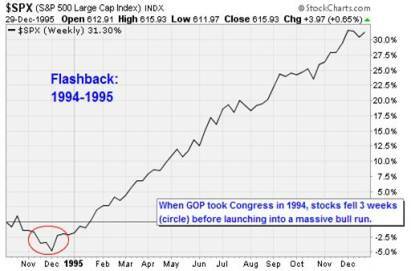 One of the greatest post-midterms stretches for the market was 1995. But from the election week in November 1994 to early December 1994, the Standard & Poor's 500 Index sank 5%, as shown above. This could easily happen again. Keep an eye out.